Mr. Shafi was commissioned in 1974 into the operation branch of Pakistan Navy where he held various positions including Commander Coastal Areas (responsible for the defence of Pakistan’s coast), Commander Logistics (Commanded over 12,000 service and civilian personnel and responsible for all logistics in the Pakistan Navy), Commander of 25th Destroyer Squadron of Pakistan Navy and also Commanded Pakistan Naval Destroyer PNS Shahjahan and Frigate PNS Shamsher.He has also held various other positions including Assistant Chief of the Naval Staff (Plans), Deputy Chief of Naval Staff (Training & Personnel as well as Operations), Director General Naval Intelligence and Principal Staff Officer to the Chief of Naval Staff. 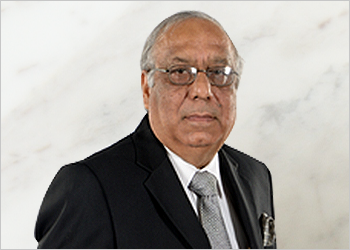 He has been the Member of the Board of Trustees of Karachi Port Trust, Chairman of Pakistan National Shipping Corporation and Chairman of Port Qasim Authority. He is also the author of Information Warfare; Research paper at NDU, Maritime Options for Pakistan; Thesis at Naval War College, Rhode Island, USA, Customs, Traditions and Ceremonials in the Pakistan Navy. He also holds prestigious Military awards which include Hilal-e-Imtiaz, Sitara-e-Imtiaz and Tamgha-e-Imtiaz. He has obtained his MSc in Defence and Strategic Studies from National Defence University, Islamabad in the year 2001 and his BSc in Physics and Mathematics from Karachi University, 1974. He has also obtained many other additional qualifications including a certification in financial management from Naval Officers Training Centre, USA – 1990.